Save the Chinese Tigers... the indigenous Chinese tiger -- the South China Tiger -- considered by some experts to be the direct descendent of the ancestral tiger -- is the most endangered of all. 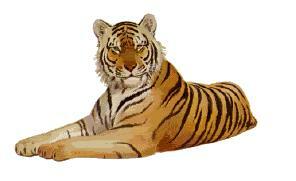 Traditional Chinese tiger paintings often have been inspired by the South China tiger. For several thousand years, this "King of the Forest", as called by the Chinese, represented ultimate power, beauty and fear in Chinese culture. ... there are so very few South China tigers left -- estimated to be between 10-30 in the wild. The Western Astrology counterpart to the Tiger of Chinese Astrology is the Sign of Aquarius.